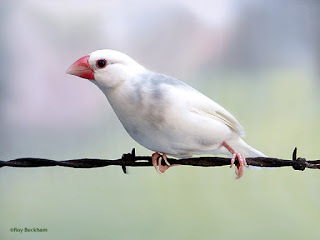 The Java sparrow (Lonchura oryzivora), also known as Java finch, Java rice sparrow or Java rice bird, is a small passerine bird. This bird is endemic to Indonesia and in nature is found in the forest, meadow, rice fields and cultivated land in Java Island and Bali Island. Their like to flock and move quickly. The main diet of these bird are rice, as well as other grains, fruits, and insects. The female birds lay the eggs between four and six white eggs, which are incubate by both parents. This species is one of the most of favorite cage birds. Illegal catch, loss of forest habitat, and the limited living space of these birds caused Java's rapidly shrinking and endangered Java Sparrow population in their natural habitat in a short time. Now it has been difficult to find the birds in the wild. This is a resident breeding bird in Java, Bali and Bawean in Indonesia. It is a popular cage bird, and has been introduced in a large number of other countries. 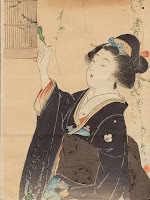 The Java sparrow has been a popular cage bird in Asia for centuries, first in Ming Dynasty China and then in Japan from the 17th century, frequently appearing in Japanese paintings and prints such as the woodblock prints, "Java Sparrow" (文鳥), by Shimazaki Ryuu (kuchi-e) in 1912. A Meiji-era writer, Natsume Sōseki, also wrote an essay about his pet Java sparrow. In Asia, the Java sparrow is the most often raised almost from birth by human breeders and owners, and they become very tame and attached to humans. They can be normally kept in relatively small cages, but let out for indoor exercise without their attempting to escape. Java Sparrow have black heads, white cheeks and large red beaks. Adult birds have gray feathers, reddish brown stomach, pink legs and red circles around their eyes. Both male and female look alike. Young birds are brown. In captivity, a variety of colourations have been bred, including white, silver/opal, fawn/isabel, pastel, cream and agate (which currently is rare within Europe captive specimens) along with the pied Java sparrow (called the sakura buncho in Japan). Pied Java male sparrow with gray markings.